With passage of time various deficiencies that rise in the body often drives the human system to an unhealthy direction. This package in Amuna Wellness Retreat Sri Lanka, nourishes the body restoring the energy system to a fully developed state through some potent Ayurvedic treatments. In addition, the Yoga retreat offers yogic practices that aims to stabilise the mind, directing the self towards its true nature. This Ayurveda Retreat Sri Lanka offers treatments that are customized to suit the individual requirements of each participant and they are prescribed by the experienced Ayurvedic physicians after diagnosis and consultation. The treatments like Shirodhara, Nawarakizi, Sarvangadhara and Panchkarma bring about holistic benefits to the entire system and balances out the various deficiencies. Each morning will start will a vidurangani Yoga session that will activate the body’s energy system from every aspect. The meditation sessions in the evening will smoothen the rough edges of the mind and help it connect with the inner stillness. The residents will be treated with a herbal porridge at the end of each yoga session and all the meals will serve fresh and organic food, arranged in village style settings. This package allows visitors to embrace good health and well-being through the holistic path of Ayurveda and Yoga. Located in the beautiful surroundings of Kumbukkandanwala, the Amuna Ayurveda Retreat Sri Lanka provides a soothing visual treat with lush greenery, flowing streams and serene lakes. This Wellness Retreat Sri Lanka covers 20 acres of fascinating landscape with the lake Kandalama glimmering enticingly under the sun at a distance. Set in the lap of nature the Amuna Ayurveda Retreat is like the Shangri La for exploring the true meaning of the of the word wellness. The organic flow of life around the centre emanates peace and tranquillity that creates a connection of the self with nature, resulting in a perfect harmony between the mind, body and soul. The refreshing breeze carrying the earthy fragrances will make the morning and evening yoga sessions a pathway to touch the inner threads of divinity present in each person. Situated in the central province, this Panchakarma Centre in Sri Lanka is amidst various rich treasures of architectural heritage. A visit to the magnificent ancient fortress of Sigiriya, which is an UNESCO heritage site or a hike to the beautiful lake Amaya will remain etched in the minds of the visitors forever. The Amuna Ayurveda Retreat Sri Lanka also introduces the guests to the rich cultural heritage of the country through various cultural programs. The peaceful ambience of this eco-friendly Wellness Retreat Sri Lanka allows the visitors to tune in to the unheard melodies of nature through the twitter of birds and vibrant colours of sunset. The grace of Sri Dhanvanthari, the patron deity of the retreat guides the visitors through their journey in the retreat. Whether one relaxes in the luxurious spa or takes a nature walk through the huge expanse of the retreat, each activity will sow new seeds of energy to rejuvenate the self. With an enchanting environment and comfortable facilities, the Amuna Ayurveda Retreat Sri Lanka, is the perfect destination to experience life in a blissful form. This Wellness Retreat Sri Lanka offers comfortable lodgings with modern amenities blending seamlessly with the natural setting. The captivating views of the green fields and distant blue mountains from the luxurious rooms makes it a perfect sanctuary to immerse the senses in the wholesome experience. The whole area is designed in the form of a traditional village using eco-friendly materials maintaining complete harmony with nature. 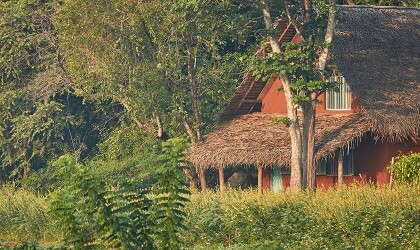 This Panchakarma Centre in Sri Lanka presents exclusive accommodations in the form of Dwelling, Tree house and Villa. All of these are tastefully designed and can accommodate two adults in a king size bed ensuring complete solitude in a tranquil setting. All the units are spacious in design and have attached bathroom amenities with rain showers, air-conditioning, hair dryers, electric shavers and a variety of other amenities ensuring the best possible experience. The Amuna Ayurveda Retreat Sri Lanka serves food that is prepared from its own extensive organic gardens which grows about 150 varieties of vegetables and herbs and about 30 varieties of fruits. The diet plan for each resident is prepared in consultation with the physicians to make it an integral part of the treatment and helps the residents to experience new level of alertness in the mind and body. The meals served to the guests in this Panchakarma Centre in Sri Lanka are completely vegetarian and freshly prepared to meet the exact nutritional requirements of every individual. The visitors can enjoy the mouth-watering dishes in the extensive natural settings of the retreat making the entire process of dining a remarkable experience. 100% refund before 30 days of arrival date. 50% refund before 20 days of arrival date. 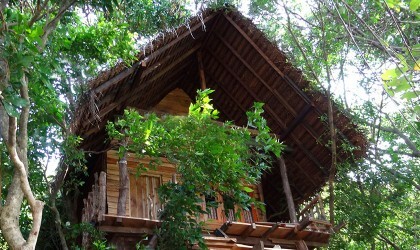 The Dwelling offers a haven of relaxation and rejuvenation during your stay at Amuna Ayurveda Retreat Sri Lanka. Enjoy holistic wellness with all the comforts of luxurious in-room amenities. This unique room offers guests a blissfully peaceful environment to mediate, relax and rejuvenate. The traditionally styled room at Amuna Ayurveda Retreat Sri Lanka offers spacious accommodation surrounded by greenery all around. 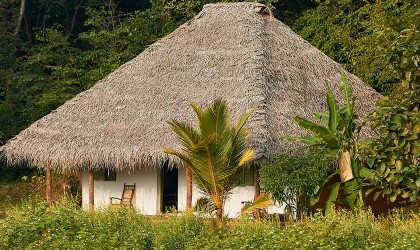 The Villas at Amuna Ayurveda Retreat Sri Lanka provide its residence with a healing accommodation experience. Retreat to the Villa after a Ayurvedic therapy session and feel one with nature in this traditional and elegantly styled, spacious room.